Our Reading, MA dental office is dedicated to providing convenient dental options for patients of all ages. 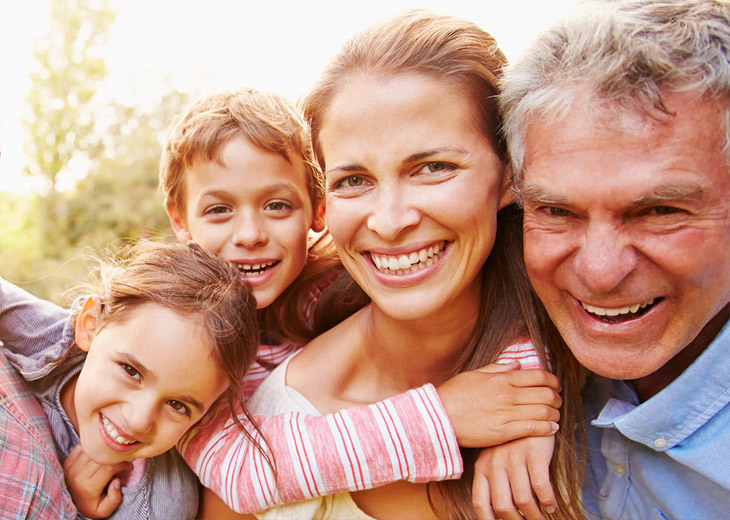 A great family dentist can treat patients from 1 to 101 and provide the services one might need throughout their entire life. Dr. Sadeghi and First Dental Associates are equipped to handle all aspects of your treatment, so call us at 781-694-1156 for your dental needs. Our staff is friendly and gentle, and you’ll never hear a lecture from us about the state of your teeth. We’re here to help, not to make you feel bad about the state of your mouth. It starts with providing your children with quality care. We dentists recommend that children see a dentist before their first birthday or when the first tooth appears. Most infants begin to develop teeth within the first few months of their life. Teething babies often develop a fever or have a running noise, and when molars come in, they can be extremely fussy. Our office will oversee the development of your child’s teeth and jawbone. You can protect their primary teeth with simple cleanings and even dental bonding that blocks out bacteria and dental decay. Not all new parents put a priority on their child’s dental health. This can create issues for them down the road. Here are facts that might help you understand your child’s dental health a little better. Bringing your child to the dentist is the best way to ensure they have healthy, beautiful teeth. It’s also the best way to get your child accustomed to visiting the dentist. At First Dental Associates, we thrive on giving children the dental care they need. Your teeth are meant to last forever, but not all teeth do. And more than 90 percent of the population will struggle with cavities. We can have dental decay, gum disease, and, of course, dental accidents can happen at any time. So when there is a problem, you need to have the means to fix the issues. Tooth breaks, fractures, decay … all of these issues can be fixed with restorative dentistry. Today’s crowns and bridges are more lifelike and long-lasting than ever. Our dental crowns are made from durable materials like zirconia and emax. These all-ceramic crowns provide you with the function you need and can naturally match the shade of your natural smile. Crowns are perhaps one the most versatile tool in dentistry. You can use crowns for a number of issues, including cosmetic reasons, chips or breaks in teeth, restoring teeth after root canals, and restoring dental implants. When the teeth are lost, it’s important to find a replacement as soon as possible. No one wants to walk around with gaps in their smile or an inability to eat the food they love. Our dentures are lifelike and easily blend in with your smile. We don’t even have to use metal clasps any longer to keep partial dentures in your mouth. If you need more stability with your teeth, dental implants are your answer. Our dental implants are made from titanium and naturally merge and preserve with the jawbone. Patients with dental implants find they can eat whatever the want again — the implants nearly match the power of natural teeth — and never again have to worry about their teeth becoming loose. You’ll care for your dental implants just like your natural teeth — and it’s extremely likely your dental implants will last for the rest of your life. You don’t need to continue your search for a great dentist. First Dental Associates can handle the care you need at every stage of your life. So give us a call today at 781-694-1156 today to schedule an appointment, or simply fill out our online form.